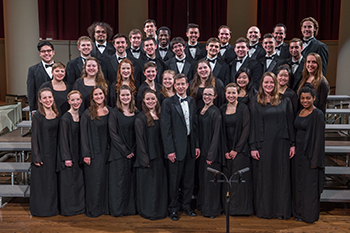 The Syracuse University Singers, the most select choral ensemble at the University, will present a concert on Saturday, April 30, at 8 p.m. in the Rose and Jules R. Setnor Auditorium, Crouse College. The concert, which is free and open to the public, will feature the ensemble’s repertoire for the upcoming European Grand Prix, a prestigious international choral competition in Varna, Bulgaria. The Singers will compete and perform in Bulgaria May 11-16. The April 30 concert will begin with works by van Dijk, Whitacre, Ešenvalds, Matsushita and Byrd. The program will continue with the competition repertoire, featuring works by Knauf, Brahms, Debussy, Webern and López-Gavilán. The concert will conclude with works by Brahms and Runestad. The Singers perform under the direction of John F. Warren, associate professor of music and director of choral activities in the College of Visual and Performing Arts’ (VPA) Rose, Jules R. and Stanford S. Setnor School of Music. Free and accessible concert parking is available on campus in the Q-1 lot, located behind Crouse College. If this lot is full or unavailable, guests will be redirected. Campus parking availability is subject to change; call 315-443-2191 for current information or for more information about the concert. The winners of each of six annual European festivals compete for the European Grand Prix. In May 2015, the University Singers competed in France at the Florilège Vocal de Tours, one of the six festivals, and won both the top Grand Prix de la Ville de Tours and the Prix du Ministere de la Culture et de la Communication, in addition to qualifying for the Grand Prix. Support for the University Singers’ trip to Bulgaria is being provided in part by Chancellor Kent Syverud and his wife, Dr. Ruth Chen; the VPA Advisory Council; and the members of the Singers. Additional fundraising is needed from alumni and friends of VPA and the Setnor School. For more information about making a gift to the University Singers, visit the University’s secure giving website or contact Jim Dungey, interim senior director of development, at 315-443-8931 or jdungey@syr.edu, or Karen Spear, executive director of regional advancement, at 315-443-2410, or ksspear@syr.edu. For nearly 50 years the University Singers have upheld a rich tradition of excellence in choral singing characteristic of the most select vocal musicians of the Setnor School of Music. The choir has been invited to sing for multiple conferences of the American Choral Directors Association, including its appearance at the 2014 Eastern Division Conference in Baltimore. Additionally, the ensemble has toured throughout the east coast of the U.S. and Canada as well as in France. Connect with Syracuse University Choirs on Facebook and Twitter @SUChoirs or visit syracuseuniversitychoirs.org.